Contracts for rental houses such as apartments, etc. are based on the agreement of both the lender and borrower according to the principle of the so-called contract freedom. However, troubles may occur depending on which of the lender side or the borrower side will restore the original state when leaving. After leaving the rental apartment, I was charged with an expensive house cleaning fee, although I used it cleanly, the security deposit (*1) was not refunded. After leaving the rental apartment, I was asked to pay a considerably expensive amount for cost of restitution (*2), and the amount was charged in the exceeding security deposit. 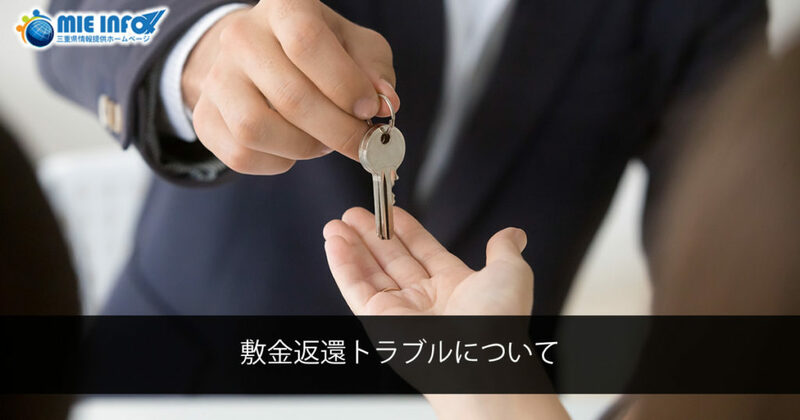 The deposit money given to the lender when moving is called Security Deposit (Shikikin) and will be used when the person borrowing a rental housing did not pay the rent or for the repair expenses when the house is dirty or damaged. When moving out, if the deposit money have not been used, it will be returned to the borrower. When the wallpaper or tatami is naturally discolored due to sunlight, deterioration and bruises due to normal use, etc., the lender will bear the repair cost. Dirt and scratches etc. caused by negligence of the borrower, the repair cost will be shouldered by the borrower. If you are having trouble with rental agreement, such as refund of deposit when leaving the rental housing, Do not worry alone, let’s consult with the center. ※When you make a phone call, an announcement will flow and will guide you to your local municipal consumer consultation desk or the Mie Prefecture Consumer Affairs Center. Click here for other troubles on consumer affairs and consultation desk.